Joy Division tribute band Disorder pulled a late night performance before an adoring crowd of about 100 guests this Friday night at a famous Goth/Industrial dance club in the heart of Newark. QXT’s looks to have once been a Spanish restaurant near the border of the ethnic-Iberian section of town termed “The Ironbound.” (Hint: Read “QXT” as a compression of “Quixote.”) At some point it transformed into NJ’s premier club for the new generation as well as veterans of the darkwave/goth/punk/industrial crowd, and heir to the legendary, long gone Pipeline. 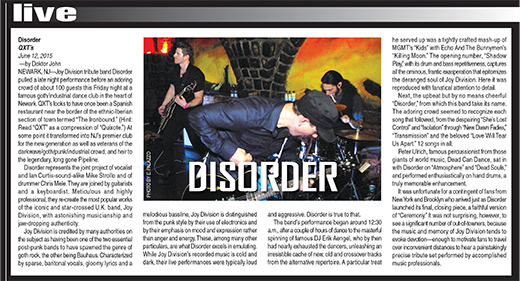 Disorder represents the joint project of , vocalist and Ian Curtis-sound-alike, Mike Strollo and of drummer Chris Mele. They are joined by guitarists and a keyboardist. Meticulous and highly professional, they recreate the most popular works of the iconic and star-crossed U.K. band, Joy Division with astonishing musicianship and jaw-dropping authenticity. Joy Division is credited by many authorities on the subject as having been one of the two essential, post-punk bands to have spawned the genre of Goth Rock, the other being Bauhaus. Characterized by sparse, baritonal vocals, gloomy lyrics and a melodious bass line, Joy Division, is distinguished from the punk style by their use of electronics and by their emphasis on mood and expression rather than anger and energy. These, among many other particulars, are what Disorder excels in emulating. While Joy Division’s recorded music is cold and dark, their live performances were typically loud and aggressive. Disorder is true to that. The band’s performance began around 12:30 AM, after a couple of hours of dance to the masterful spinning of famous DJ Erik Aengel, who by then had nearly exhausted the dancers, unleashing an irresistible cache of new, old and crossover tracks from the alternative repertoire. A particular treat he served up was a tightly crafted mash up of MGMT’s “Kids” with Echo and the Bunnymen’s “Killing Moon.” The opening number, “Shadow Play,” with its drum and bass repetitiveness, captures all the ominous, frantic exasperation that epitomizes the deranged soul of Joy Division. Here it was reproduced with fanatical attention to detail. 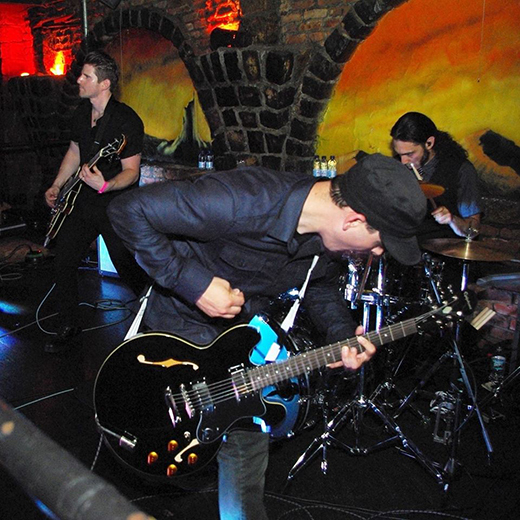 Next, the upbeat but by no means cheerful “Disorder,” from which this band take its name. The adoring crowd seemed to recognize each song that followed, from the despairing “She’s Lost Control” and “Isolation” through “New Dawn Fades,” “Transmission” and the beloved “Love Will Tear Us Apart.” Twelve songs in all. Peter Ulrich, famous percussionist from those giants of world music, Dead Can Dance, sat in with Disorder on “Atmosphere” and “Dead Souls.” and performed enthusiastically on hand drums, a truly memorable enhancement. Brooklyn who arrived just as Disorder launched its final, closing piece, a faithful version of “Ceremony.” It was not surprising, however to see a significant number of out-of-towners, because the music and memory of Joy Division tends to evoke devotion—enough to motivate fans to travel over inconvenient distances to hear a pain-stakingly precise tribute set performed by accomplished music professionals.